I'll be talking with John Wesley Smith on his Destiny Survival Radio show again tomorrow. We'll spend an hour discussing a variety of topics, and especially how works of fiction can sometimes be more effective than nonfiction in opening the eyes of those who might not otherwise take an interest in prepping or survival topics. I've had a lot of comments to this effect already since the release of The Pulse, especially among some of my own friends and family who could not really relate to books like Bug Out and may perceive interest in such topics as fanatical. Reading a fictional story of an unfolding SHTF scenario sheds a whole new light on the matter though, and people can start to visualize how such an event could really happen. For a review from the perspective of a prepper and survivalist, here's Jim Cobb's take on the book from his blog, Survival Weekly: http://survivalweekly.com/2269/the-pulse-by-scott-b-williams/ Jim will soon be a fellow Ulysses Press author, with his own book: Prepper's Home Defense coming out in October. 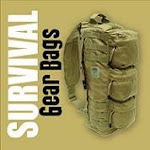 It's always interesting to me to see the growing number of new articles about survival and SHTF concerns published on sites that are primarily focused on other pursuits. But it's not really surprising to see this kind of thing on sailing websites and blogs, because people who are self-reliant and contrarian enough to make a lifestyle out of living aboard and cruising places on small sailboats tend to spend a lot of time thinking about these things anyway. I first started meeting families and individuals living this lifestyle more than twenty years ago, on my kayak trip through the Caribbean. Even back then many of them I talked to expressed the same kinds of concerns that are frequently discussed on survival sites today. A big part of the reason most of them chose the independence of the cruising life is that they feel safer. There's nothing quite as reassuring as having a well-found vessel under you, capable of taking you anywhere in the world as long as the wind still blows. One of my all-time favorite sailing bloggers posted a review of The Pulse last week and then went on to write more about the over-reliance on technology that most of us modern sailors have in common. The fact is, while there may never be a catastrophic solar flare as strong as the one in my novel that takes out the grid throughout the hemisphere, any number of things, including deliberate action by the government, can render the man-made constellation of orbiting GPS satellites inoperable. The author brings out some really good points to consider in choosing such a boat to build, and even mentions some of my favorite designers, such as James Wharram. I plan to expand my thoughts on this one in another post soon, as bug out boats were a big part of my book, Bug Out Vehicles and Shelters, and of course, I'm currently building just such a boat myself. If you've tried to order the paperback version of Bug Out: The Complete Plan for Escaping a Catastrophic Disaster Before It's Too Late from Amazon in the past few weeks, you might have noticed that it is not listed as "In Stock" as usual, but rather as "Ships in 11-13 Days". Well, that 11-13 days has turned into longer, and I just found out from my publisher that the reason for this is that the book is backordered. This is not something that normally would have happened, as it has been reprinted several times already when each print run sold out, but the good news is that the reason they ran out is that Barnes & Noble placed a large order that suddenly cleaned out the supply in the publisher's warehouse. The reason that this is good news is that Barnes & Noble has finally gotten on board with how serious the topics of survival and prepping are, and the bookstore chain will now be stocking Bug Out and many related titles on their store shelves in most, if not all locations. In fact, my publisher said they were going to have an end-cap dedicated to the subject in the next month or so. This is an about face for this chain, as they were reluctant to stock many of these titles until their popularity increased. I stopped by my nearest Barnes & Noble store the other day to check this out, and sure enough, there were copies of Bug Out, Getting Out Alive, and Bug Out Vehicles displayed prominently on the shelves, along with some excellent related titles by other authors. Hopefully the backorders will be filled soon and Bug Out will soon be listed as "In Stock" on Amazon again. I apologize to anyone who may have ordered the book without knowing this and is still waiting. "My favorite adventure stories have always been those that cast ordinary people into extraordinary circumstances and predicaments their previous lives could not possibly prepare them for. Although I sometimes enjoy reading works of fiction that involve larger than life characters with highly specialized training and superior fitness, skills and abilities, you won’t find any fearless heroes of that kind in The Pulse. After experiencing first hand the aftermath of Hurricane Katrina and living in the impact zone where the power grid was destroyed and stayed down for weeks, I often wondered what it would be like if that situation were much more widespread and long-lasting. If a solar flare or EMP attack took out electrical power and shut down most forms of communication and transportation in North America, the aftermath would be far worse than that of any hurricane and there would be no sudden influx of crews from neighboring states to work around the clock to rebuild the grid. Grocery stores would soon be stripped bare and no delivery trucks would be running to replenish their stocks. People would become desperate in short order, especially in large urban areas where the limited supplies available would be quickly consumed. Far lesser events have shown that such desperation quickly strips away the thin veneer of civilization that keeps complex societies in order. Violence would become rampant, and law enforcement agencies would be overwhelmed and unable to protect the citizens of their jurisdictions. Those who would survive such chaos would have to act on their own and act quickly to seek safe refuge. In The Pulse I chose to focus not on the technical aspects of the solar event or the subsequent rebuilding and reorganizing of civilization in the aftermath, but rather on the immediate concerns of two groups of characters. Casey Drager and her roommate, Jessica, are college students at Tulane University, in New Orleans. Casey’s friend, Grant, an older graduate student who was living in the city after the devastation of Katrina, knows from experience that they have to get out and get out fast. Casey’s father, who is especially close to his only daughter after the loss of her mother in a car accident years before, is away on a short sailing vacation in the Caribbean with his brother when the pulse strikes. Among islands a thousand miles from the U.S. mainland and suddenly cut off from all communication with his daughter, Artie is desperate to find out if she is okay. Like any father in such a predicament, Artie Drager will do everything in his power to find his daughter, but with no transportation back to North America faster than his brother’s sailboat, he has no way of knowing if she will still be there when he finally reaches New Orleans. Obstacles and dangers await both parties as they deal with their situations as best they can; and everyone involved has to quickly adapt to the new reality of a world without the safety net of technology and organized society." 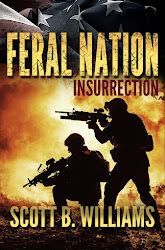 In addition to the above, I would like to add for my readers here that unlike some survival fiction books, it was not my intention to write an instructional manual masquerading as a novel. While you will recognize some of the actions of the characters as advice I've given here and in my nonfiction books, the people in the story are not survival experts and were certainly not planning for or even thinking about an event like this. The college girls and their friend "bug out" of New Orleans, and do so on bicycles because that is the only reasonable means available to them, but they aren't doing so because they were prepared to or even familiar with the term. Their older friend, Grant, does have fairly extensive camping experience and as an Anthropology graduate student, he has spent a summer doing a field study in a remote region of South American jungle, so he does have some skill and knowledge of living without the support of the grid. In the other storyline, where the father is trying to get back to his daughter, you will see some of the advantages of travel by boat in a situation like this - something I've also talked about here and in the nonfiction books. Could a solar flare really occur that would have effects as devastating as those described in this story? I don't know for sure, and scientists who study these things have differing opinions as well. I think it's possible, and many believe that it is highly likely or even imminent. I certainly hope not, because if something like this ever does happen, the aftermath will be truly horrible. In the book, this solar event sets the story in motion and is of course, central to the plot, but I don't spend a lot of time detailing the science of it or the wider reaction around the affected areas. I purposely keep my characters "in the dark" about the extent of it, and focus on how they will meet their immediate needs and get to where they want to be. This is probably how it would be for most of us anyway if such an event occurred. Without communication and rapid transportation, news would travel slow and wild speculation and guessing would prevail. 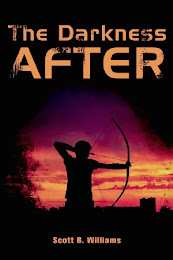 I hope you will enjoy the story for what it is: essentially a father's quest to find his way back to his daughter, and a total immersion in to a harsh new reality for three young college students who end up in a labyrinth of rivers and swamps north of the city. The Pulse was originally scheduled to be released on July 10, but I did get word from the publisher that copies have shipped, and now it looks like Amazon will have the book in stock on June 25. If you plan to buy it soon, ordering on the release day always helps make a book more visible on Amazon by causing a spike in sales rank. You can check the book's page here or by clicking on the cover image at the top of this page to find out exactly when it will be in stock, as this is always subject to change. If you do read the book, I look forward to your feedback, and if there is enough interest in the plight of these characters, the ending leaves a good opportunity to follow up with a sequel that I would like to write. Most regular readers here know that I was working on a novel over the last few months since Bug Out Vehicles and Shelters was released. Some of you may have already seen the book's Amazon page, but if not, here's a preview of the front and back covers. I'll post more detailed information about this book here soon. In the meantime, if you'd like a preview, the "Look Inside This Book" feature has been enabled on Amazon, so you can read the opening scenes and see if you'd like to read more. The book should be available in print and Kindle form early next month. As massive solar flares bombard the Earth, an intense electromagnetic pulse instantly destroys the power grid throughout North America. Within hours, desperate citizens panic and anarchy descends. Surrounded by chaos, Casey Drager, a student at Tulane University, must save herself from the havoc in the streets of New Orleans. 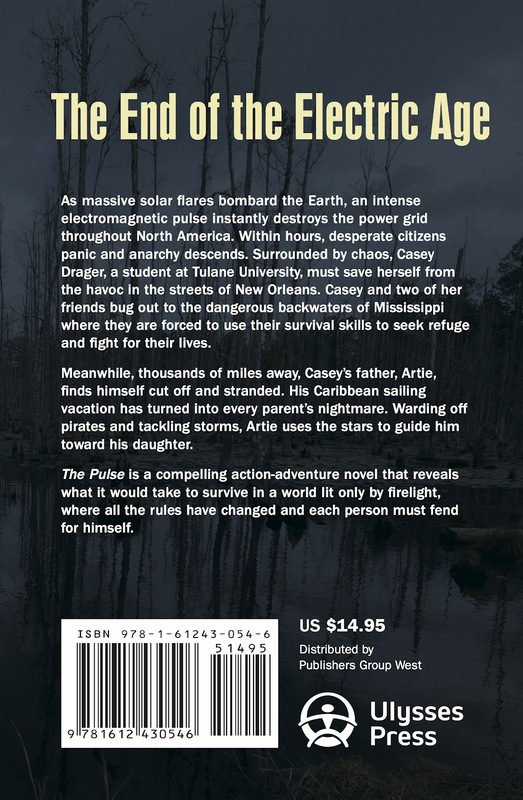 Casey and two of her friends bug out to the dangerous backwaters of Mississippi where they are forced to use their survival skills to seek refuge and fight for their lives. Meanwhile, thousands of miles away, Casey’s father, Artie, finds himself cut off and stranded. His Caribbean sailing vacation has turned into every parent’s nightmare. Warding off pirates and tackling storms, Artie uses the stars to guide him toward his daughter. 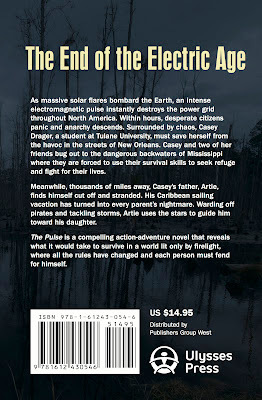 The Pulse is a compelling action-adventure novel that reveals what it would take to survive in a world lit only by firelight, where all the rules have changed and each person must fend for himself. One of the all-time most popular posts here on Bug Out Survival is the piece I wrote back in 2010 on some of my ideas and modifications for fitting a Ruger 10/22 into a bug-out bag. The reason is obvious: the Ruger 10/22 has long been a favorite in a semi-automatic carbine of this caliber, and because of it's great reliability record and aftermarket support, many people planning to carry a .22 long gun as part of their bug-out equipment would prefer to have this model over most choices out there. The 10/22 is a compact carbine even in its standard configuration, and even more so with a 16-inch barrel, but until recently, if you wanted to conceal it completely inside the average backpack or bug-out bag, you needed to either fit a bulky and somewhat heavier aftermarket folding stock, or take the receiver out of the stock as I described in the above-mentioned post. I've carried the 10/22 both ways on various wilderness trips. Folding stocks such as the Butler Creek model I used completely change the balance and feel of the weapon, and add a lot of bulk inside the pack when folded. Taking the standard rifle apart works, but does entail some risk of losing internal parts if you're not careful, and takes a lot more time than simply folding a stock. The new take-down version of the 10/22 brings a whole new reason to choose this weapon, as you can now have one of the best semi-auto .22 carbines in existence with the packability of other take-down models such as the Marlin Papoose and Henry AR-7. For serious packing of a bug-out bag, I would certainly lose the bulky, fitted backpack it comes with, though this may be a handy way to carry it in other situations such as in a vehicle or boat. I haven't picked up one of these yet, but for $300 I probably will and look forward to comparing it to my other 10/22 rifles. I suppose since I write about bug vehicles and bug out locations, I could call a recent motorcycle trip to North Carolina and Tennessee work - or at least research. 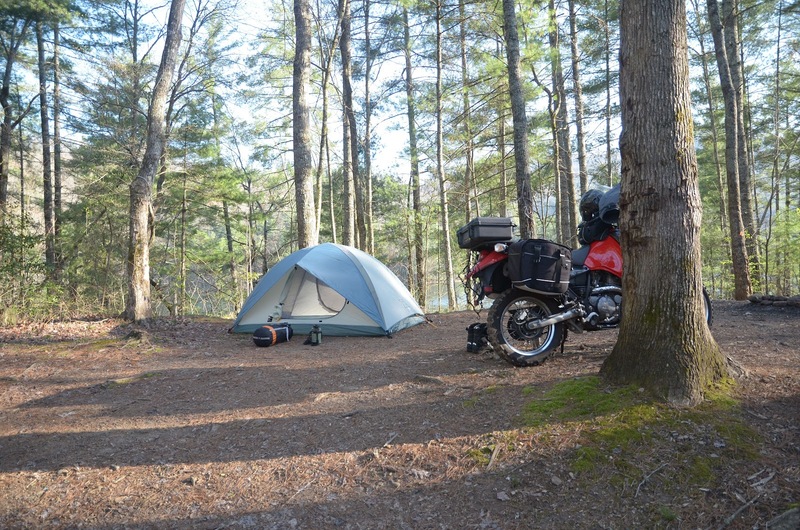 But truth is that a short getaway trip to the mountains, camping off my KLR650 was really more of a great way to unwind after a few long weeks of finishing up the revisions and final details of my latest book - the novel that will be released in July. I've written about the Kawasaki KLR650 here before, and I'm sure many readers have either owned one or know somebody that does. It's not a motorcycle that excels at any one thing, but rather one that does everything well enough. For this trip, that meant everything from surviving the truck traffic on the interstate at 75 mph, to negotiating twisty pavement in the mountains, such as the infamous "Tail of the Dragon" stretch of North Carolina's Highway 129. But most importantly, it meant the freedom to explore off-road on gravel forest service roads and beyond. I went alone on this ride so I wouldn't have to do much scheduling or planning, and besides, I needed time to myself anyway. 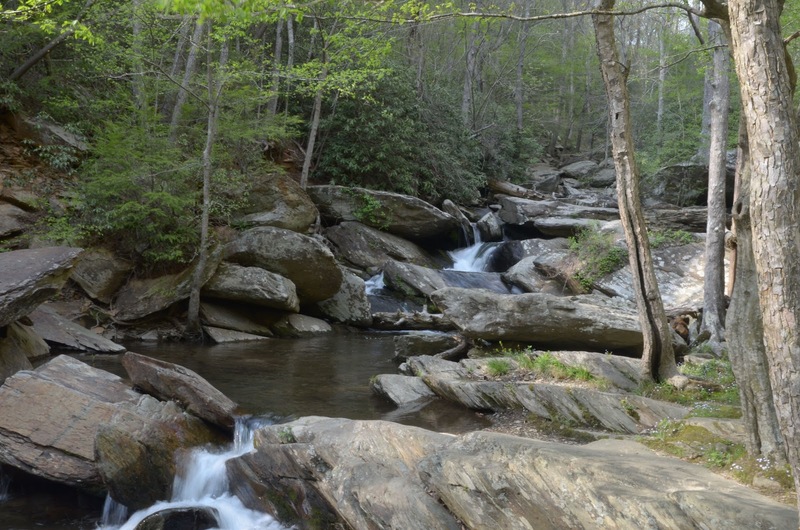 Mainly, I wanted to revisit some of my favorite areas in the regions, such as the Joyce-Kilmer and Citico Creek wilderness areas, where I've embarked upon many a solo backpacking trip in times past. 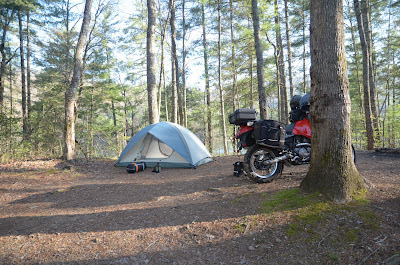 Hiking this time was limited, but with the KLR I was able to get to some nice, secluded campsite with the bike and all my gear, some of them places few four-wheeled vehicles could reach. 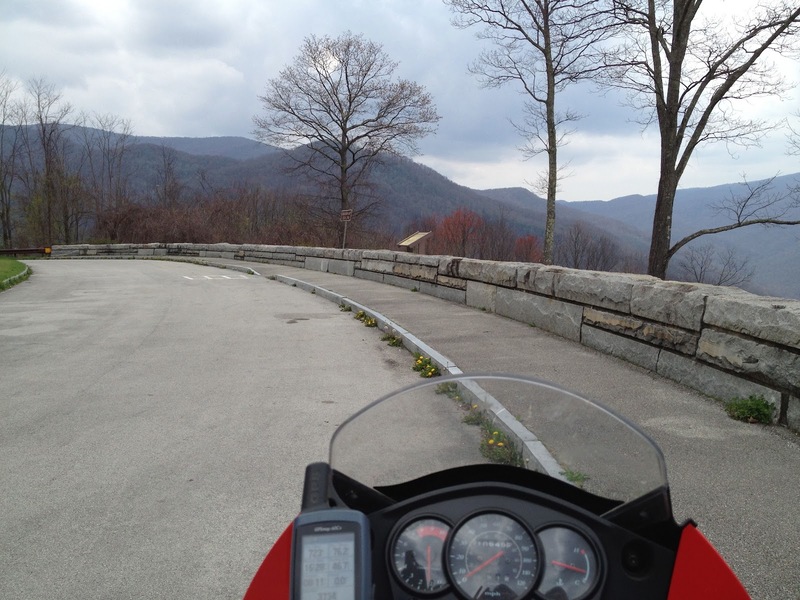 As anyone who's visited this area knows, the driving (and especially motorcycle riding) is spectacular. Going in the off-season and during the week makes it easy to avoid the crowds. 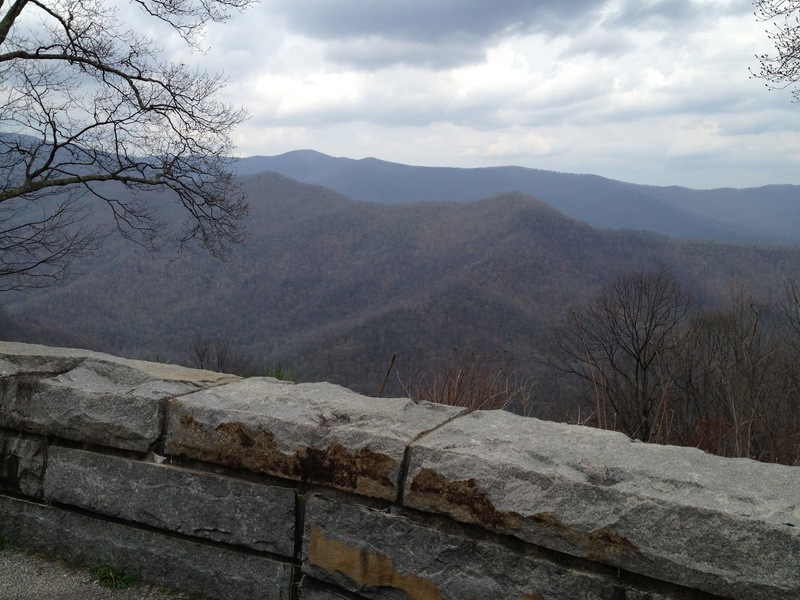 One of the most scenic roads is the Cherohala Skyway, which runs through some of the wildest areas of the southern Appalachians, from Tellico Plains, TN to Robbinsville, NC. This is a view out into the Citico Creek Wilderness Area, which is described on p. 158 of my book: Bug Out: The Complete Plan for Escaping a Catastrophic Disaster Before It's Too Late. A black bear encounter I had one dark night deep in the middle of this wilderness reminds me to choose campsites carefully and take all the precautions to keep a clean camp when in these mountains. This a place where you can seriously disappear if you have a need to, especially if you don't mind bushwhacking into the rhododendron thickets in the deep ravines along the drainages. 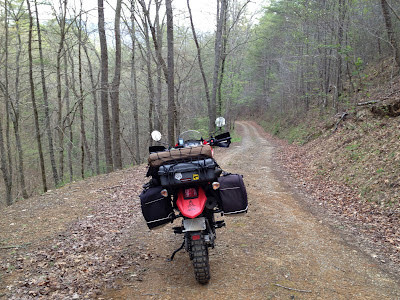 But as nice as the paved mountain roads like the Cherohala Skyway are, the KLR really comes into its own and proves its worth on the endless miles of gravel forest service roads that lead off the beaten path. Exploring them leads to all kinds of great places, like this fantastic stream. One thing these mountains are not short of is water, so carrying a lot of it is not necessary as long as you have a means to purify it. It's hard to leave a place like this and ride back home, but after this little escape I'm now planning a longer motorcycle trek out West to some of my favorite hang-outs there, like New Mexico's Gila National Forest. 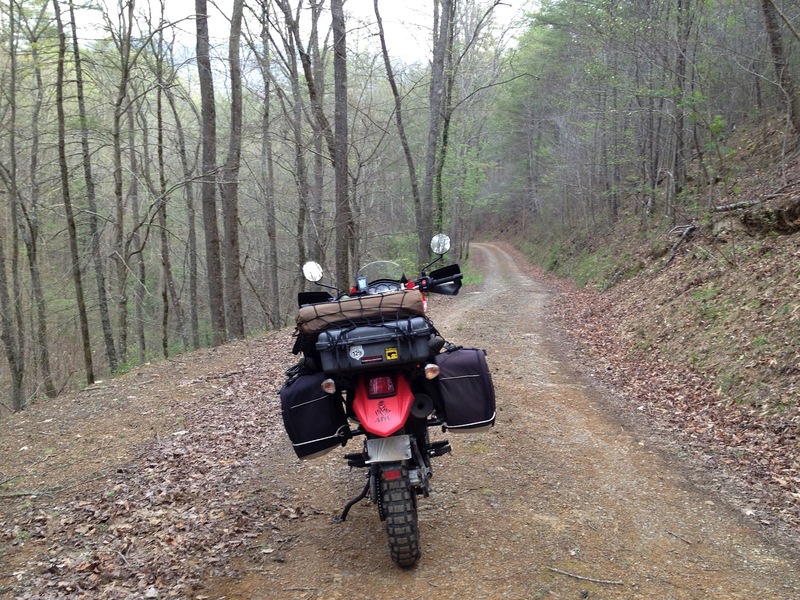 I have no doubt that the trusty KLR will get me there and back. 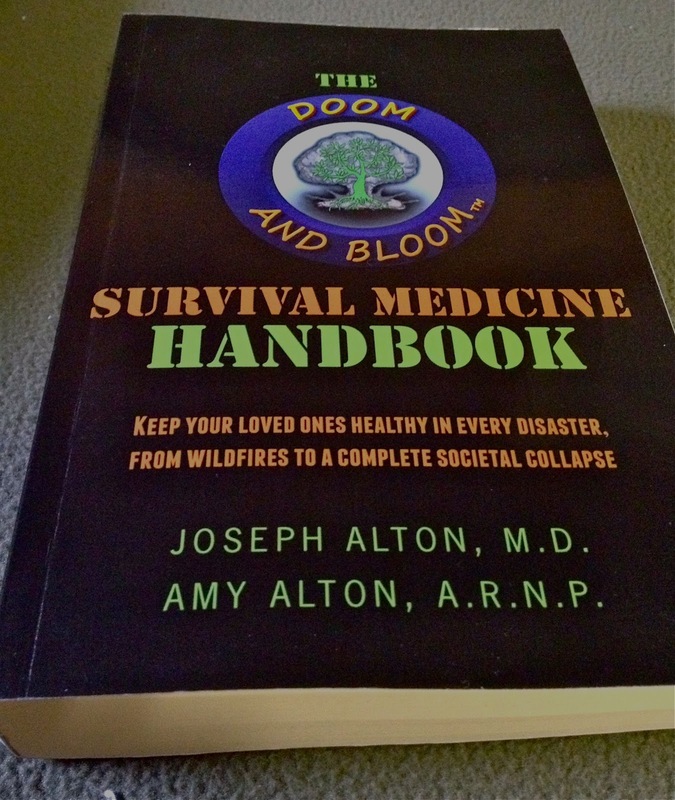 Survival Medicine Handbook Giveaway Winner! And the winner is: Kenny! Kenny's comment is the 13th one down on last week's post. I guess number 13 can bring good luck sometimes! For all those who didn't win, keep an eye out for more giveaways, as I have lately been receiving a flood of books and other products to review and test. And again, I think this book is a worthwhile addition to your survival library, whether or not can get it for free! Empact America is dedicated to preparing, protecting and recovering from an EMP (Electromagnetic Pulse) event - a very real threat that could plunge our electricity-dependant civilization into total chaos. This interview comes at a good time, when I have been thinking a lot about just such a scenario. 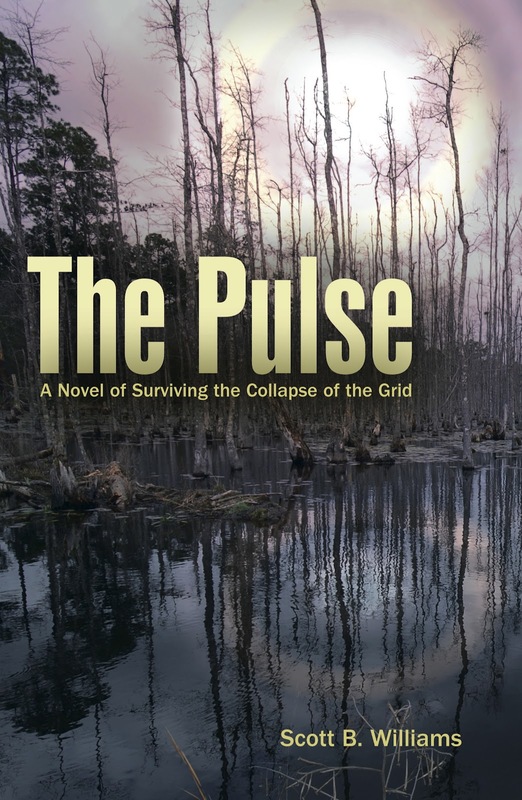 Last week I just finished the manuscript of my latest book: The Pulse: A Novel of Surviving the Collapse of the Grid, which will be published in July. 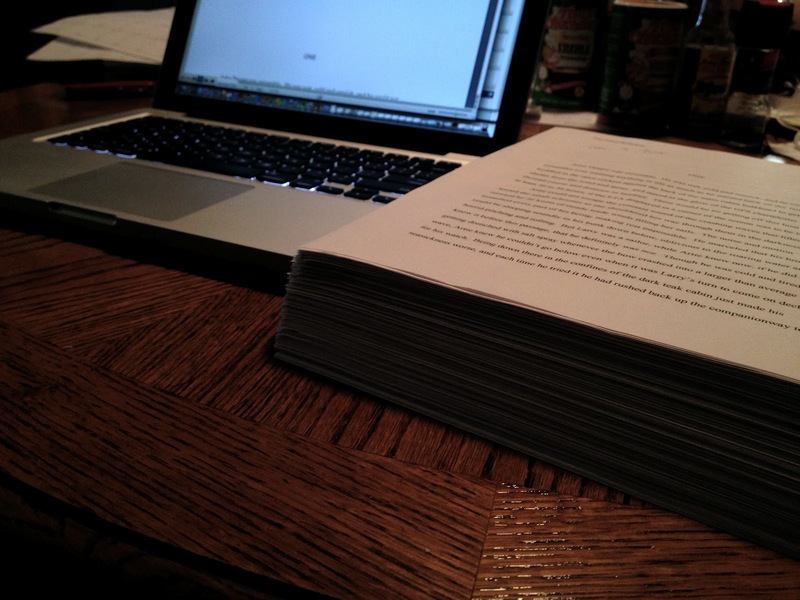 Here's the completed manuscript: all 109,415 words. I'll be posting more about that book here on Bug Out Survival as soon as details like the cover are finalized. It does involve a major grid-down scenario, putting the main characters in a variety of dangerous situations, requiring them to use many of the techniques and methods I've written about here on this site and in my previous non-fiction books. This book is unique among practical medical handbooks in that it specifically addresses the issues of medical help when conventional means of help is not available, such as in a post-SHTF scenario. Topics include all sorts of problems ranging from sanitation, hygiene and infections to environmental factors that can lead to heat stroke, hypothermia, burns, smoke inhalation and even snake bite and stings. There are many additional resources in the back of this 440-page book, including a glossary of medical terminology and a list of YouTube Video Resources. Look for a full review of the book here in the near future as soon I get caught up enough to read it in depth (As many of you know, I've been quite busy with my own latest book project). In the meantime, if you'd like a chance at winning this signed copy of the Survival Medicine Handbook, just leave a comment on this post with a username and I'll put all the names in a hat and pick the winner one week from tonight. It doesn't matter what you say in your comment, everyone gets an equal chance based on the luck of the draw. Look for the winner to be announced here next Monday night, and good luck! I have a lot of catching up to do here on Bug Out Survival later this month. I've received several good books and interesting new products to review and will be posting about those soon. The last few weeks have been consumed by a rush to complete my latest book project, which will be off to the editors on Monday. But yesterday, I took an hour out of my writing schedule to enjoy another interesting interview with John Wesley Smith on his Destiny Survival Radio Show. John wrote about the interview today on his Destiny Survival blog, in this post: What Will You Do About a Bug-Out Shelter? We discussed some of the points I brought in in Bug Out Vehicles and Shelters regarding mobile and fixed retreats, as well as choosing bug-out locations and other tips on advance planning. Here's the full interview if you want to listen. Unfortunately, like last time I was on the show, there was a minor glitch with Blog Talk Radio, so the start of the show was delayed. It does play though, if you bear with it through a couple minutes of silence at the beginning. Survival fitness is something I've talked about here a few times before, and I think it's important to bring it up again now and then to reiterate the importance of staying in shape to increase your odds of making it through a dangerous or stressful situation. There are many ways to accomplish the goal of staying physically ready for events that may test your endurance or strength, the most common of course, being gym workouts with weights or machines, as well as cardio-intensive training such as running, cycling or walking. Excuses for not using these methods are as plentiful as huge array of workout equipment you can find for sale at any sporting goods store, and range from time restraints to cost considerations. There used to be a time when most people did enough physical work that none of this was necessary anyway, but unless you're in the really small percentage of those today who earn their living doing something like brick-laying or chopping wood with an axe, chances are you need to work out to stay in shape. What if you could take a simple tool like a sledgehammer and use it to work practically your entire body without the need to buy dumbbells, barbells or a Bowflex or some other kind of machine? This isn't the kind of iron-pumping workout designed to build muscles like Arnold Schwarzenegger, but if you want to increase your functional strength and stamina, as well as speed and power that could make the difference in a fight or flight survival scenario, pick up a 16lb. sledge or even an 8 or 10-pounder and try these 23 exercises:"
I've done this routine a few times since discovering this video on YouTube and I can tell you that it is a great workout that will leave you feeling like you've done something when you're finished. You can determine the intensity by the speed with which you execute each movement as well as by choking up or down on the handle of the hammer. You don't need much weight to get the effectiveness, and in that regard it's much like working out with kettlebells; more about the technique than the weight. If you want to try it, I would recommend first following along with the video using an unweighted stick or axe handle to learn the proper form. Then start with a real sledgehammer. He's using a 16-pounder in the video, but unless you're in great shape already, you'll probably find that's too heavy to swing with good form, speed and power. The difference in this and merely lifting weight is that you have to overcome the inertia of all that weight swinging at speed to stop each stroke in the air with control, as he is demonstrating in the video. You don't need a lot of time to do this entire routine, maybe one minute for each exercise, but if that's not enough you can use it for circuit training and go through the whole thing again when you're done: two, three or even four times if you're able. Almost everyone has a sledgehammer somewhere in the toolshed, and if you don't you can go out and pick one up for $20 to $30 at any building supply or hardware store. It's a cheap piece of equipment compared to stuff designed specifically for exercise, and you'll probably find plenty of other uses for it as well. Here's something a little different that I thought I would pass on after reading about it on numerous boating blogs and forums I frequent. It makes you wonder what's going to be taxed out of existence next when a state department of revenue goes after a man who simply wanted to build a boat to take his son fishing. One thing that all preppers and people with an interest in survival have in common is the desire to be self-sufficient. The ability to do-it-yourself and make things from scratch can go a long way towards freeing you from dependance upon expensive manufactured versions of the same things, which in many cases are inferior to what you could make yourself. As long-time readers here probably know, I'm a big fan of travel by boat, whether on remote wilderness rivers, through southern swamps, or along the coast or open ocean. As a result of my interest in a variety of small craft, as well as a life-long interest in woodworking, I began building my own boats some 18 years ago, and have since built more than a dozen vessels, ranging from sea kayaks and canoes to fishing boats and offshore sailboats. Most of my wilderness and sea journeys by boat would not have been possible if I had to buy the factory versions of these boats I built myself - mainly because I could have never afforded them. But aside from the cost, there is an indescribable satisfaction to be had from turning a pile of wood and some epoxy and fiberglass into a beautiful and functional watercraft and then paddling or sailing it to some wild place. While you can save a lot of money doing it yourself, building a boat is still far from free, especially if you care enough about how it looks and how long it will last to use quality materials. And there's also no getting around the fact that it's a lot of hard work. The same can be said about anything worth building or doing right. You need some basic tools, as well as the ability to use them, and unless you have a talent for design, a set of plans drawn by someone who does. Thousands of boats are built this way in garages and backyards every year all over America, and one would think that the right to do so would be unquestioned and unchallenged. That's exactly what a Murpheesboro, Tennessee man named Jonathan King thought when he purchased plans and built a simple, low-cost 14-foot wooden boat so he could take his seven-year-old son fishing. Tennessee, like most states, requires boats that are fitted with engines or sails for propulsion to be registered with the state in which it is operated. This involves a small annual or semi-annual fee that is not unreasonable, but if you build your own boat from scratch, you first have to get it inspected so that a HIN (hull identification number) can be issued. This number is required in order to apply for the registration number. Like the registration, getting this number is not that big of a deal in my experience here in Mississippi, and having it does help prove ownership if the boat is stolen, so while it's a minor aggravation, most home boatbuilders don't complain. As he points out, this story is going viral on the Internet, as well it should. Those of you who are not into boats may not think it matters, but it's just one example of increasing loss of freedoms and restriction on what you can and can't do on your own property. As some have pointed out, if a "use tax" can be levied against a home boatbuilder, what's to stop them from taxing those who build their own picnic table or doghouse, make their own clothing or bake their own cookies? Isn't the economy already hurting ordinary people bad enough without punishing them for trying to save some money by making things themselves? Another thing many Americans may not realize, especially if they are not boaters, is that most European countries have incredibly strict laws regulating building and using boats. For example, in the U.K., a person building a boat at home for their own use is not permitted to sell that vessel until five years after it is completed. That means if you spend hundreds or thousands of dollars building your dream boat, and then either discover it was not your cup or tea or perhaps need the money because you lost your job - tough luck, you're stuck with it. Other European laws strictly regulate the type and size of vessel that is permitted to go offshore, and require you to buy and equip your boat with all sorts of expensive safety equipment that does not necessarily apply to the type of craft you own. For example, in some countries sea kayaks are not permitted to travel more than 1-mile from the shore, despite the fact that they are among the most seaworthy of vessels. There are many people who would like to see such laws passed here as well, and if this "use tax" issue is not resolved in Tennessee, it looks like we're already headed that way. I stumbled across a new video review of Bug Out Vehicles and Shelters just the other night while browsing YouTube. I had to watch it all, of course, as it's good to see or read an unbiased, but well-considered review in which the reviewer discusses both what he or she likes, as well as dislikes about a product or book. This led me to click through to the reviewer's YouTube channel after watching the video about my book, and browsing through it, I saw that Urbivalist Dan has a wealth of insightful videos that may be of interest to readers of this blog. His channel is called Urban Survival Tools, and with more than 100 episodes posted, he has explored a wide range of topics such as Know Your Area's Disaster History, How to Find Survivalists in Your Area, How Krav Maga Can Save Your Bacon, as well many reviews of books and products. Urbivalist Dan has an easygoing on-camera presence and a clear, conversational voice that makes watch his videos easy. I recommend you browse his channel if you haven't seen it before, and I'm sure your find several episodes (or "prepisodes" as he calls them) that will be of interest to you. I had another interesting discussion on Blog Talk Radio last night: this time with James Talmage Stevens, AKA "Dr. Prepper". I was scheduled to talk with him for the first hour of last night's episode of his Dr Prepper CPR show, but we had such a good conversation we ended up going the two full hours. 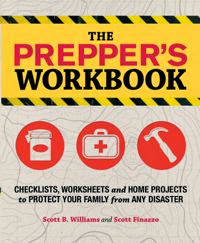 Dr. Prepper has been writing about preparedness since 1974, and certainly has a lot of insight on the topic. This is the second time I've been a guest on one of his shows, and thankfully, we had a better connection this time so the audio is much better. Although the focus of the interview was my newest book: Bug Out Vehicles and Shelters, we covered a lot of ground that went beyond just bugging out. The following is a repost from http://www.scottbwilliams.com/, for those of you who may be subscribers to this site or may have found Bug Out Survival from a link on another site or perhaps a web search and have not visited my main site. I've now rebuilt my home site with WordPress and incorporated a front page blog there I will be using to publish news of my book projects and interviews, as well as other writing and blogging related stuff that doesn't necessarily fit into the context of this site. "Last night I was the guest on a Blog Talk Radio Show called The Other Side... APrepper's Path, hosted by Lynna (http://prepperspath.com/). This show is part of the regular line-up on The Prepper Broadcasting Network and airs Thursday nights at 6:00 pm PST. 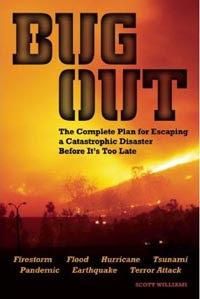 I really enjoyed talking with Lynna about my latest book: Bug Out Vehicles and Shelters. She had obviously taken the time to read the book before the show and asked some good questions that led to an interesting discussion. We talked about bug-out vehicles in general and especially some of the advantages of, and reasons for choosing various types of boats for certain bug-out scenarios and situations. We also talked about the concept of mobile retreats and discussed modifications to ordinary vehicles to optimize them for bug-out purposes. In addition, a caller with extensive kayaking experience and a military background joined in the conversation with his perspective on how he might utilize such a boat in his particular location near the Chesapeake Bay." Survival Fitness: What's Your New Year's Resolution? This is the time of year when lots of people make New Year's resolutions, and many of those resolutions involve commitments to get back in shape. A lot of those thoughts are fueled by guilty feelings brought on by eating rich holiday foods in excess, as well as general increased levels of depression from being stuck inside a lot more during the winter months. Unfortunately, most people don't stick to their New Year's resolutions any more than they do most fitness goals they may set at other times of the year. The reason is that most people see getting back in shape as a temporary problem that they think they can solve in a few weeks. When it doesn't happen, they just give up and go back to their old ways, quickly undoing any fitness gains they may have made. To be successful at long-term fitness, you must change your way of thinking about it and make it a permanent part of your lifestyle. This doesn't mean you have to join an expensive gym and go work out with a bunch of sweaty strangers in public, but you've got to make a conscious effort to get regular exercise and eat sensibly if you expect lasting benefits. I've written about this before, but when it comes to survival preparedness, nothing you can buy in the way of gear or equipment can make as much difference in your odds of getting through a disaster as having the proper mindset and the physical conditioning to deal with adversity. Many people don't want to hear that, as it is easier to purchase a bunch of stuff than to actually get outdoors and subject themselves to rigorous camping trips, hikes, bike rides or survival skills training exercises. But the more challenges you put yourself through physically, the more confidence you will gain in your abilities, and it is that confidence that gives you the mindset you need. We live in a time when everyday life is easier than it has ever been, in terms of physical effort needed to accomplish necessary tasks. For many people, seeking comfort is a primary goal and they have become so accustomed to always experiencing comfortable temperatures, safe and secure living and working environments and a limitless supply of infinitely varied food and drink that they would go to pieces if these things were taken away. Rigorous exercise is one way to quickly snap your body out of the comfort zone. By stressing your muscles and aerobic capacity you can gradually condition yourself to become comfortable with increasing levels of activity to the point where you will actually begin to enjoy it and want to push harder. The key to this enjoyment though is to find exercise activities that you actually like doing. For me, hiking, paddling a canoe or kayak or riding a bicycle are all things I look forward to. I may not get as much enjoyment out of the dumbbell workout routine I do three times per week, but by keeping it sensible and limiting the amount of time it takes to complete it, it's been easy to stick with it. I've also been involved in the martial arts since my early teens, and while I'm not actively practicing Kenpo in a school these days, I still do a daily stretching routine first thing in the morning and often go through forms, techniques and basics to maintain at least some of my ability. This year one of my main fitness goals is to increase my weekly mileage on my road bike and participate in several century (100-mile) rides. 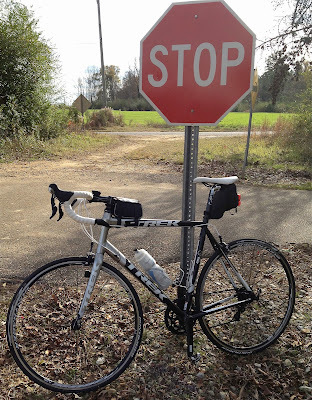 I've found that long-distance bike riding is one of the most enjoyable aerobic workouts for me, and I like it much better than running, which seems like drudgery. If I can get in a decent ride a few times per week I feel a whole lot better, have much more energy and can eat just about anything I want without worry. If I had the time to do it, I would prefer to spend my days canoeing or kayaking or back country hiking in some stunning mountain wilderness, but that's just not feasible nearly as often as a one or two hour bike ride. I'm fortunate to live in an area where I have many miles of quiet country roads with little traffic, good hills and smooth pavement right outside my door. With two major book projects to complete in the next few months, I'm forced to spend a lot of time sitting in a chair with a keyboard in front of me as are many people in this strange lifestyle our modern technology has enabled. For me, it's essential to take frequent activity breaks and use other parts of my body besides my fingers. Fitness has to be more than a New Year's resolution. It has to be a lifestyle, especially as you get older, if you want to continue doing the things that were effortless in your teens and twenties. A lifestyle of fitness is also essential you are to have any hope of surviving the kind of major upheaval many preppers are concerned about. If you're reading survival blogs such as this one, you've probably at least given some thought to scenarios that could snap you out of a high-tech life of ease in a heartbeat. If so, what are you doing to keep your mind and body prepared to deal with it? Have you made a New Year's resolution to get back in shape? If so, will you give up on it by February or March, or are you ready to go beyond temporary resolutions you can't keep and change your lifestyle permanently?